Developing short-term and long-term goals - Brilliant Breakthroughs, Inc. Follow these practical 10 steps to logically accomplish your long-term goals. Small Business Owners today must master developing and balancing both short-term and long-term goals. These activities are often overlooked by newer entrepreneurs because the don’t understand the value of this. 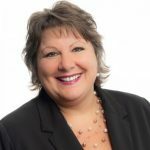 Additionally, tenured or successful Small Business Owners (SBOs) don’t spend enough time on this because they are busy or have forgotten the magical power this provided to improve their Business’s Success. Are you guilty of overlooking the development and balancing of your short-term and long-term goals? Brian Tracy’s classic 1993 book, “Maximum Achievement” reveals the Fourth Rule of of Goal Setting: develop both short-term and long-term goals. Tracy explains that short-term goals should be about 90 days. Over the past couple years it’s becoming more common to hear SBOs discussing their 90 Day Challenge. I prefer to call them 90 Day Sprints. Why is 90 days good for short-term goals? Even though 90 days isn’t instant gratification, it is something we can easily adopt. We can imagine or visualize ourselves starting up, working through the strategy, and completing the task within 90 days. It appears working on something for 90 days is easier to mentally grasp. I believe it’s because a 9o days is like a sprint instead of the longer year goal. In 1 quarter we can self-manage our actions with precision and effectiveness. Why do we need long-term goals? We have great ambitions. More than 90 days is required to achieve larger or more complex goals. Some larger goals may take 2 – 3 years or even 15 – 20 years. Unless you have a magic genie hiding in a bottle somewhere, you need to expect some goals will take longer to achieve. The timeframe isn’t important, what is important? You accomplish your goals with balance. Why do we need to balance our goals? It’s pretty simple, we need time to keep us from trying to do everything at once. I don’t recall who said this, “Time keeps everything from happening all it once.” Our days are busy enough. Time helps us manage our activities load. Balancing both short-term and long-term goals supports our journey of having immediate wins while working toward those grand goals we all have. There’s another balance to master – it’s balancing goals throughout your whole life. Tracy refers to this as his Fourth Principle of Goal Setting. It isn’t healthy and will become counter productive (because of the Law of Diminishing Returns) if you only work Your Business’s Goals. The balancing act between work and your personal life is essential to Your Business’s Success. Since you are not a machine and only a mere mortal, it’s critical for you to eat, sleep, take breaks, hang out with friends, volunteer, and engage in hobbies or other activities. This balance of activities will assist you with fresh perspectives, greater energy, more enthusiasm, and a body to support you accomplishing your goals. Write down your Long-term Goals for Your Business’s Success. Select one Long-term Goal. It could be a goal to accomplish in a year or two. 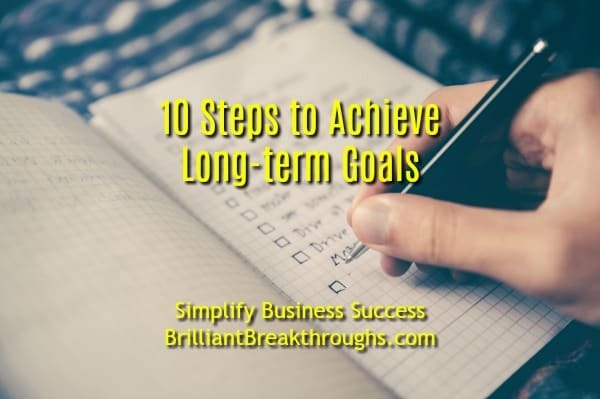 Break down or chuck down the different milestones or phases of this long-term goal. Now create your milestones into 90 Day Sprints. If necessary, split up larger milestones into more than one 90 Day Sprint. Involve your calendar. Write your 90 Day Sprints into your calendar. Breakdown Your 90 Day Sprints into actionables to deliver either weekly or daily and get this on your calendar. Activate Your 90 Day Sprints by stepping into action and log your results. Continue required actions until Your 90 Day Sprint Goal is accomplished. Celebrate in whatever manner inspires you to continue to your next 90 Day Sprint. Repeat until your Long-term Goals are achieved. REMEMBER: Make sure you take care of yourself in two ways: Balance personal and professional 90 Day Sprints – you can do both simultaneously. Also, it’s important to remember to take breaks or vacations to rejuvenate yourself! Need help on which goal to activate first? Go here to share some basic business information and request a time for a no-cost consultation. Let’s have a winner’s conversation to simplify your success. Do you already do something similar to these 10 steps? If your process is successful keep doing it. If not, give this a try – especially on those projects that appear really big! p.s. : You create Your Success with each choice you make. Choose wisely – productive action will always support Your Goals! ← Have the Winter Olympics influenced your business’s performance?